Purim was Positively Perfect @ Brandeis! On Purim day, parents, grandparents, graduates and former parents joined our Middle School students for a community Megillah reading. Students then received a special purim snack (rainbow bagels and hamentashen). Throughout the day, teachers celebrated Purim through various classroom activities. 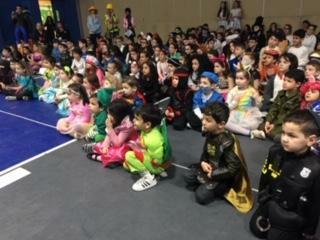 On Friday, Shushan Purim, our students were welcomed by Purim Music playing loudly in the halls. Children watched as Illusionist Eric Wilzig captivated them with his magic. Our younger students were entertained by Fluffy the Clown. Students were then welcomed to a school-wide carnival with inflatables and booths created and operated by our oldest 8th grade students and parent volunteers. Younger students had the opportunity to bounce in several inflatables as well. In celebration of Purim, Morah Yochi invited Kindergarten fathers, uncles, grandfathers and other relatives to the classroom to build their very own Leytzan.